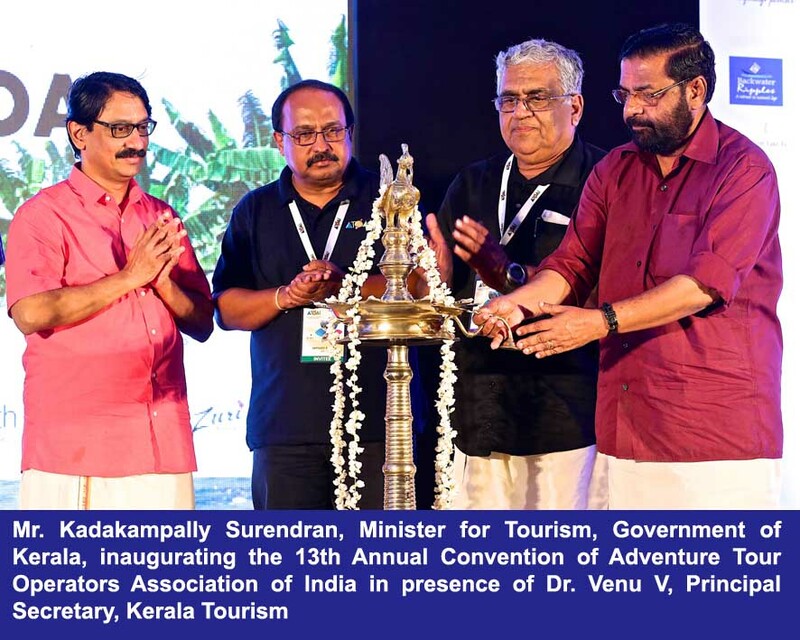 Mr. Kadakampally Surendran, Minister of Tourism, Government of Kerala, inaugurated the 13th Annual Convention of Adventure Tour Operators Association of India (ATOAI), organized on the theme of ‘Emerging Pathways’ in the presence of Mr. Satyajeet Rajan, Director General Tourism, Ministry of Tourism, Government of India, and Dr. V. Venu, Principal Secretary – Tourism, Government of Kerala. With the aim to position India as the adventure capital of the world, ATOAI has proposed Ministry of Tourism, Government of India to declare 2018 as the Year of Adventure Tourism in India. Over 300 delegates from all over India have come together for the annual convention. “As part of developing the adventure tourism infrastructure, the tourism board plans to develop water and adventure parks for various action and water-based activities. Moreover, Kerala Tourism has planned to develop river circuit connecting eight rivers in Kannur and Kasaragod districts with an estimated cost of Rs. 325 crores”, he added. The tourism industry is one of the major revenue generating sectors in Kerala, contributing a total revenue of Rs. 38,000 crores. Around 10.3 lakh foreign tourists and 1.32 crore domestic tourists visited Kerala in 2016. From trekking the hills to wildlife sanctuaries, India offers a plethora of adventurous activities to attract adventurous enthusiasts. India- an incredible tourist destination has high tourism potential to be explored by adventure seekers. Kerala is indeed India’s most happening destination offering an array of adventure packed destinations, including gushing rivers, high-altitude mountains, dense forests and vast stretches of the sea. The State is blessed with a wide range of natural and scenic beauty, which supports diversified adventure activities such as trekking, surfing, wildlife safaris, paragliding. With the aim to promote adventure tourism and increase the tourist footfall in the State, Kerala Tourism has inculcated several stringent safety guidelines for adventure tour operators. These guidelines have been developed in tune with international standards post discussion with various departments. The convention included sessions on how to achieve these goals, networking amongst delegates, exhibits by State tourism boards and industry players, and FAM trips and a day of adventure to showcase Kerala as a unique tourist destination. The event was attended by all stakeholders, including government, tourism boards, industry and experts for their contribution with the sole aim to develop India as the adventure capital of the world.